Reframe It is an extension (available for both Firefox and IE) that allows you to make comments on any page or portion of a page and share that comment with the entire Reframe It community, or your chosen contacts. Here's how it works: Sign up for an account and download the extension. A toolbar is installed on the right side of your browser. When you find something of interest on a Web page, extend the toolbar and highlight the portion of the page. Then you can make a comment on whatever it is you highlight. You can then choose to make those comments public or private. Of course, for others to see your comments, they will need to download the extension as well. You can create groups that are either public, semi-private, or exclusive to those you invite. 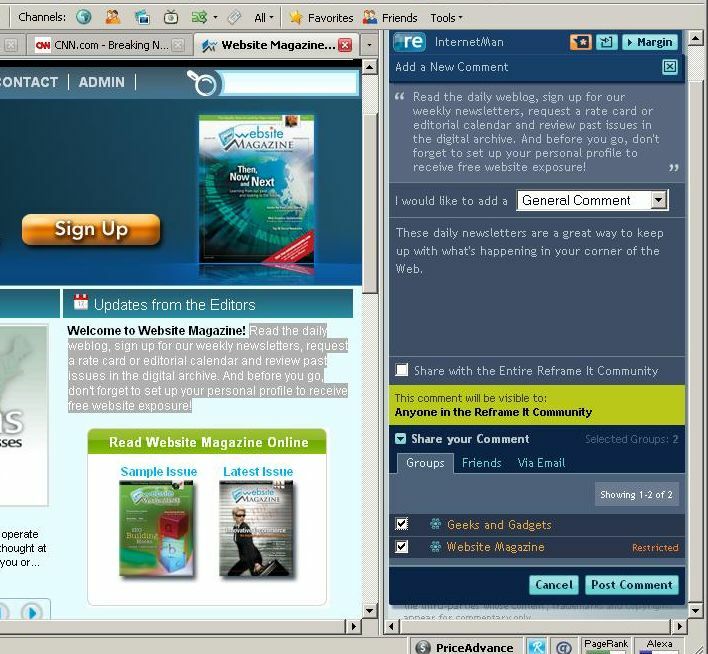 Below is a partial screen shot of me making a comment on WebsiteMagazine.com's home page, and selected to share the comment both publicly in a group and exclusively with the newly-created Website Magazine group. You can see the highlighted portion of the page, the expanded toolbar, my comments and my sharing selections. It's hard to imagine that this extension will see Internet-wide adoption (because a download is necessary and because you have to use the toolbar), but I do see some practical uses. It could serve as a nice collaboration tool for businesses - both for use in design and for gathering input and feedback from around the Web. It could be a nice way to generate and share ideas throughout your company, across all pages of your website - even on competitors' sites. Should you have considerable website traffic and participation, it could even serve as a way to get feedback from your consumers. Although, it will probably be a tough sell to get them to download an application. So far, the biggest drawback (outside of the need for collaborating parties to install the extension) is the toolbar on the right. It's stuck there. I would prefer a small button in my existing toolbars or somewhere else on the browser page, even in the "Tools" menu. I don't need the toolbar there at all times.